I stock Essential Therapeutics essential oils, which are a trusted Australian brand of 100% pure essential oils sourced from all around the world. The essential oils are sourced from the country that is known to produce the finest quality of aroma and therapeutic properties of that particular oil. Some essential oils also have a few different options - like you can get Australian lavender or true lavender from France. On that topic, did you know that more lavender is sold from France than is produced each year? How could this be? Well a lot of the lavender essential oil that is on the market isn’t real lavender essential oil at all, it is produced in a lab. Essential Therapeutics is a practitioner grade brand - so we can trust that the essential oils are authentic and are of actual market value (no crazy mark-ups like with the MLM essential oil companies). Some of the essential oils are also available as organic. You may purchase these directly from me at my Kenmore clinic. Or enquire if you are having a mobile massage and would like to order some that I can bring with me to your appointment. If you live in Brisbane and are just interested in the essential oils (not having a massage as well) you are welcome to make an appointment to come to me and purchase some. I can even help you in your selection and how to use the essential oils as I am a qualified Aromatherapist. I have written quite a few blogs on Aromatherapy so you may want to check those out too. You may access the price list here. Note that prices of the essential oils are subject to change as the supplier sometimes changes prices suddenly due to environmental factors (e.g. if a particular oil had a low yield year it would go up in price). The price list also includes many of the other products I sell. I also create perfumes using Essential Therapeutics essential oils in an organic jojoba base. They are roll-on 100% natural perfumes - much nicer than those synthetic fake fragrance perfumes you pay hundreds of dollars for. My perfumes are priced between $15 to $30 for 10mL bottle in a recyclable glass bottle. I have some samples in my Kenmore clinic, along with my face oils. Essential Restoratives products are created with all natural ingredients, by me. The philosophy of Essential Restoratives is that nature has provided all that we need to heal, nurture and nourish ourselves - on the inside and the outside. Essential Restoratives face oils are comparable with the expensive oils on the market - but at an affordable price. The ingredients chosen are high quality, organic where possible, and potent. The ingredients are specifically chosen to synergistically work for the most benefit. All ingredients are active, and are natural. Only made with non-phototoxic (non UV sensitising) essential oils. Only made with essential oils that are beneficial, healing and gentle on the skin. Nothing harsh. Emollient and occlusive - forms a lightweight protective barrier (healing for irritated skin). Deeply nourishing and highly beneficial (more details below). Made with love and care, in small batches to ensure they are fresh and high quality. You may purchase from my Etsy store here. Benefits: A synergistic blend of 14 active pure plant ingredients, this face oil is deeply nourishing and replenishing, especially beneficial for restoring moisture to dry, mature and normal skin. It is high in natural vitamins including A & E, essential fatty acids, and antioxidants that work to prevent premature ageing, soften the skin and fine lines, promote cellular regeneration and support collagen and elastin production. It encourages a healthy radiant complexion. Directions: Apply 4 - 6 drops to fingertips and massage onto clean dry skin, including your face and neck. Use every morning and night. If you wish to combine products (for extremely dry skin), would recommend you use a 100% natural face serum first and use the face oil over it to lock in moisture. Otherwise, it will usually be nourishing enough on its own. Sunscreen and make-up easily glide over - simply give the face oil a few minutes to sink in. Benefits: A synergistic blend of 15 active pure plant ingredients, this face oil is nourishing, anti-inflammatory & especially beneficial for restoring moisture & balance to sensitive, combination, inflamed, acneic & oily skin. High in vitamins including A & E, essential fatty acids & antioxidants that work to prevent premature ageing, speed healing & encourage cellular regeneration as well as increase collagen & elastin production for a healthy radiant complexion. If you wish to combine products, would recommend you use a 100% natural face serum first and use the face oil over it to lock in moisture. However the product will most likely be more affective on its own as sometimes combining products can irritate the skin. Face oils are very nourishing on their own. Sunscreen and make-up easily glide over it - simply give the face oil a few minutes to sink in. Benefits: A synergistic blend of 6 active pure plant ingredients including neroli & carrot seed essential oils, this under-eye oil is deeply nourishing with natural vitamins A & E, essential fatty acids and antioxidants. It works to prevent premature ageing and helps to reduce fine lines. Directions: Apply 1 drop to fingertips and gently apply under the eye, especially targeting any fine lines, and include over the eyebrows. Use every morning and night. Note that ACO indicates an Australian Certified Organic ingredient, and organic ingredients are used wherever possible. Each ingredient is chosen for a specific purpose and blended to a proportion that will be both beneficial and deeply nourishing for the skin as the oils blended together create a synergistic effect. The essential oils used are at very safe and therapeutic doses, so as not to cause any irritation and prevent sensitisation that can occur in some other products on the market. Provided you are not allergic to any of the ingredients, you can expect these products to be safe and highly beneficial. (If you do have an allergy to a specific ingredient listed, please contact me to have a bespoke face oil created for you instead - I'm happy to provide this service for Brisbane based women and men). Is a natural emollient, and helps to lock in moisture and is suitable for all skin types. It is enriched with vitamins A, B, and E and essential fatty acids. Nourishes dry skin and soothes inflammation. Beneficial for eczema, psoriasis, dermatitis, & dry scaly skin. A lighter, easily absorbed emollient, high in essential fatty acids and nourishing. It is especially good for oily skin. It features anti-inflammatory properties making it good for soothing sensitive and irritated skin. This features in Revive and Regenerate Face oil. Deeply moisturising and an emollient, rich in vitamins A, C, D, E and proteins. Revitalising the appearance of the skin - especially good for dry and mature skin. Rich in palmitoleic (fatty) acid. Softening and protective. This oil is deeply nourishing and features Renew and Replenish Face oil. Borage is an excellent emollient, very moisturising and temporarily firming, revitalising the skin's appearance. It is especially good for ageing skin. This features in Renew and Replenish Face oil. Calendula is anti-inflammatory, and promotes wound healing. It is very affective on rashes, chapped skin, abrasions, sunburn, superficial burns, insect bites, and eczema. Sunflower oil is moisturising, emollient, high in essential fatty acids vitamins A and E. Regenerating. This healing oil features in both Face oils. Rich in vitamins A, B & E, minerals, omega-6 essential fatty acids and omega-9 fatty acids. Revitalises the appearance of skin with an ability to penetrate to deeper layers of the skin. Promotes elasticity and slows the appearance of ageing. This restorative oil features in both Face oils. Very hydrating and rich in fatty acids including linoleic acid and gamma linoleic acid, it helps to improve skin tone and texture. Moisturising, rejuvenating, occlusive & readily absorbed, repairs damaged skin, softens lines, and smoothes skin. This rejuvenating oil, which is also good for balancing women's hormones, features in both Face oils. Closely mimics the skin’s natural oils to penetrate deep into the skin layers, hemp seed is easily absorbed and non-greasy. Contains all of the known essential amino acids and offers the perfectly balanced 3:1 ratio of Omega 6 (Linoleic) to Omega 3 (alpha-Linolenic) essential fatty acids. Delivers potent antioxidant and anti-inflammatory properties for treatment of acne, dermatitis and other skin inflammatory conditions. It is a natural antioxidant and anti-ageing. Also contains vitamins E, B, D, carotene and chlorophyll. Softens, smooths, soothes inflamed skin. Works to prevent blemishes and suitable for all skin types. Note that it does not contain THC. Features in both Face oils, of course! Pomegranate is packed full of antioxidants to help protect skin from damaging free radicals and is therefore anti-ageing. High in vitamin E, punicic acid (unique to this oil) it promotes regeneration of skin cells - helping to repair skin and accelerate healing. Highly anti-inflammatory it can help heal acne, eczema and other skin conditions as well as reduce scarring and hyperpigmentation. Pomegranate promotes collagen and elastin production and aids in wrinkle prevention and reduction, and helps to firm skin. It is rich in vitamins, antioxidants, and omega fatty acids. It also helps to restore the natural pH balance of skin. A special ingredient, used in both Face oils. Easily absorbed, rose hip oil has many vitamins - especially vitamin A, as well as essential fatty acids (omega 3, 6 and 9) and antioxidants. This non-greasy highly moisturising oil is very healing and provides nourishment to all skin types. It is an emollient, occlusive, and very anti-ageing to help to smooth fine lines and wrinkles. Regenerative and anti-inflammatory, it is great for all skin conditions and works to reduce scar tissue and hyperpigmentation. Also helpful for wounds, burns, and eczema. Both Face oils contain organic rose hip oil. One of the best skin healing oils, tamanu is rejuvenating, anti-ageing, anti-inflammatory, anti-bacterial and anti-microbial. It can help clear acne and other inflammatory conditions. It is a natural antioxidant and vitamin E and assists in skin regeneration. Promotes healing and prevents scarring from wounds. Also good for Rosacea. A special ingredient - when tamanu oil is used on its own it isn't very pleasant smelling and is a heavy oil, however synergistically blended with the other oils in the Revive and Regenerate Face oil (still at a therapeutic dose), the result is a regenerative Face oil that is very pleasant to use, easily absorbed and has a lovely gentle natural scent. An anti-ageing and healing ingredient, sea buckthorn berries extract is recognised for outstanding cellular regeneration properties - it contains a high concentration of carotenoids. Also containing natural tocopherols (vitamin E) and essential fatty acids, the oil works to heal the skin and skin conditions (eczema, acne, dermatitis), improve suppleness and fight the signs of ageing. Another very special ingredient, this extract contributes to the natural slightly red hue of both of the Face oils. It is highly regenerative. Not that only therapeutic/practitioner grade and TGA listed/tested essential oils are used (Essential Therapeutics). Carrot seed is high in carotene and vitamin A and is regenerative for the skin, and it improves the circulation in the skin and has healing properties. It is used to improve skin tone in mature skins, couperose, wounds, eczema and psoriasis. Utilised in both Face oils at a therapeutic, generous and safe dose. Is anti-inflammatory - making it very calming for red, inflamed, irritated skin conditions including acne, dermatitis, eczema and psoriasis. Suitable for all skin types, including sensitive. It also has antiseptic properties and has skin healing properties. Especially good for sensitive and inflamed skin, this features in the Revive and Regenerate face oil. 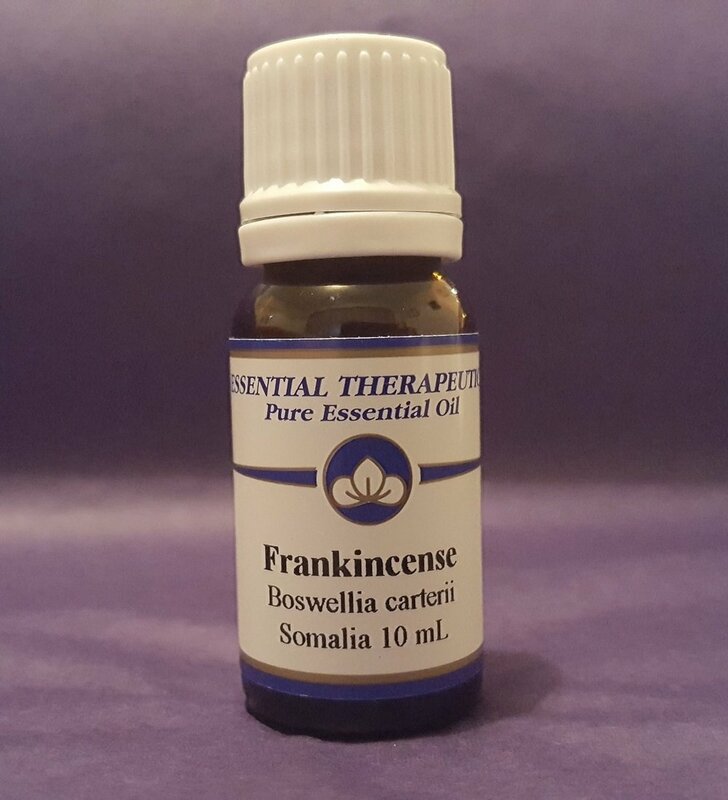 Frankincense has become a popular essential oils due to its healing properties. It has antiseptic, astringent, regenerative and skin healing properties. It is used to improve the tone of mature and damaged skin, to heal wounds and reduces scars. Especially good for dry and mature skin, this features in the Renew and Replenish face oil. Geranium has antiseptic, astringent and skin healing properties. It helps regulate sebum production, making it especially useful for oily and combination skin, although it is beneficial for all skin types. It can assist to improve broken capillaries. Great for balancing all types of skin, this is used in both face oils. Palmarosa has skin healing and hydrating properties. Its antiseptic and skin healing properties make it useful in treating acne, eczema, infected skin conditions and wounds. This restorative and replenishing oil is used in both face oils. Has anti-inflammatory, antiseptic, astringent and wound healing properties. It is used to treat wounds, acne, eczema, inflamed and irritated skin, and sensitive skin. Especially good for sensitive, acne and inflamed skin, this features in the Revive and Regenerate face oil. So there you have it - both face oils are packed with natural nutritive ingredients to feed your skin so that it restores to a healthy radiant glow!